Discover how to take control of spending and operational performance by ensuring companywide adoption of your e-procurement system. The success of your e-procurement system relies on making sure people use it, and that they understand how instrumental its capabilities are to their daily routines. Whether you've already implemented an e-procurement solution or are still weighing your options, this informative white paper from Coupa can help you identify ways to expedite its success throughout your organization. Written for CFOs and financial decision-makers, the white paper provides practical tips for facilitating employee buy-in around your new processes. 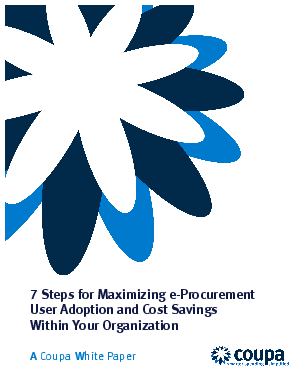 Your new e-procurement solution is only as productive as the people using it. Download the white paper now and find out what it takes to get employees on board so you can meet your ROI goals fast.